What comes to mind when we consider Britain? Writers and poets through the ages have depicted British ways with tea and scones and cucumber sandwiches. Visions of Wimbledon tennis enjoyed with strawberries and cream, test cricket at Lords, pies and mash, the Union Jack, Buckingham Palace, they all portray stiff upper lip Britain. Over fifty years ago Bob Dylan wrote, "The Times They are a-changing" and that title fits perfectly into the circumstances we are about to consider. Sadiq Khan, a Muslim and a member of the British Labour Party was recently elected Mayor of London. His victory raised questions and provoked wild and sometimes wise speculation. How could someone other than a dyed in the wool Brit land the job? A Muslim? How? What is happening in the Old Dart? The Daily Beast brought the reason home for all: 'London, the United Kingdom, Europe and the wider West have been going through something of an identity crisis." They say the mounting Muslim tide throughout the world is forcing change. The head-in-the-sand crowd will bury the facts and avoid reality. More astute observers will note other dramatic changes and include population demographics to the study. 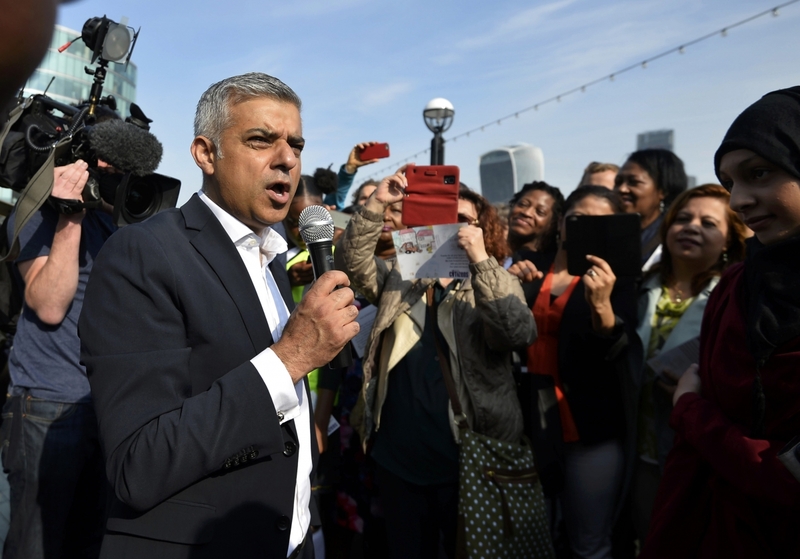 Mayor Khan is a member of the British Labour Party where too many headlines this year have had to do with controversial anti-Semitism by leading figures. An article published last May by the Gatestone Institute said: "Two of the Labour Party's senior members were suspended as a result of their anti-Semitic remarks, and there is talk that 50 secret suspensions have been made." The author of the article Denis MacEoin declared 'the British Labour Party is collapsing." He blamed fierce anti-Semitism as a major cause, but despite that negative climate, Khan won anyway. The new Mayor has shown no signs of anti-Semitism. His first official function was to attend the Holocaust Memorial where he was seated next to Chief Rabbi Ephraim Mirvis, who just a week before, publicly criticized the anti-Semitism within the British Labour Party. That same world population analysis said: "Of the 7.17 million people living in London at the time of the 2001 census, only 5.23 million had actually been born in the United Kingdom. The remaining two million people were born outside the UK. The most common country of birth for London residents (other than the UK) was India – 172,162 people living in London in 2001 were born there – followed closely by the Republic of Ireland (172,162) people." Each sector provides its own energy and adds to the cultural diversity of the city. This is true for cities and locations all over the world as we watch vast population numbers spread globally. Today London embraces Christian, Muslim, Hindu, Jewish, Sikh and Buddhist religions. 15.8 per-cent identify as having no religion.All these variables must learn to live with one another or disaster looms. With our wide open spaces we may miss the current crisis. The world is facing a population crunch. According to United Nations forecasts the world population will 8.51 billion by 2030. It reached 7.3 billion mid 2015. The UN report says: "During 2015-2050, half of the world's population growth is expected to be concentrated in nine countries: India, Nigeria, Pakistan, Democratic Republic of the Congo, Ethiopia, United Republic of Tanzania, United States of America, Indonesia and Uganda, listed according to the size of their contribution to the total growth." Their forecast warns Europe will decline: "the populations of 48 countries or areas in the world are expected to decrease between 2015 and 2050. Several countries are expected to see their populations decline by more than 15 per cent by 2050, including Bosnia and Herzegovina, Bulgaria, Croatia, Hungary, Japan, Latvia, Lithuania, Republic of Moldova, Romania, Serbia, and Ukraine." India is expected to overtake China in population numbers. The world is changing. People are moving from place to place in search of a better life and brighter prospects.How do we cope with changing times? The pie man on the corner may soon be replaced by a falafel stand. So it is time to embrace change because it is happening regardless. So how do we cope? Ancient Greek playwright Sophocles explains: "One word frees us of all the weight and pain of life: That word is love."